Last week a friend sent me a link to this provocative blog post by famed jazz trumpet player, Nicholas Payton, who argues that jazz is dead. To me this isn’t news, since I wrote the same thing in a lengthy piece in Toronto’s eyeweekly back in 1992. And like Payton, who is being berated by his pals, I was pilloried by jazz purists who disagreed vehemently with me. Payton makes it clear that he is ‘for the music but against the word’ jazz. Instead he says that he plays post-modern New Orleans music. To my mind he makes total sense. Jazz is so fractured and yet so codified in contemporary music that it only makes sense to move beyond traditional categories that are no longer relevant. 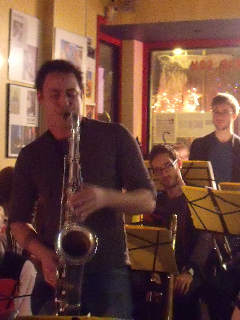 In this sense, I would say that Franky Rousseau, a boyish Montrealer who brought a 19-piece band from New York to play a sensational concert of original music last Friday night at Ottawa’s ultra-intimate Avant-Garde Bar, plays Post-Modern Canadian music. Rousseau’s band was made up of a group of young players who are all either too young to shave or who as members of the hipster generation are too cool to scrape their off their scraggly facial fur with a razor. But as players they were sharp as sharp can be. Really, it has been a long time since I was so excited by so many inventive young players. Yacine Boularès (right) and Levon Henry were both standouts on tenor, and there were other fine soloists as well, but the rhythm section was what really knocked me out. It consisted of Austin Peralta on piano (who also served up some screaming solos), as well as Franky’s brother Matt Rousseau on bass, guitarist Michael Valeanu and drummer Arthur Hnatek, all of whom were absolutely lethal. The presence of a sampler/synth player also added a powerful punch, especially in the funkier bits. Above all though it is Rousseau’s beautiful, fun and imaginative music that made the evening so special, and that likely inspired so many great players to make the 10 hour drive from Brooklyn to Ottawa without any hope of a cash reward. Rouseau’s first composition was a suite titled Hope, dedicated to the fine philanthropic work of the brothers Kielburger. It was an exhilarating piece, filled with unexpected grooves and punches, catchy melodies and rich harmonies. I admit to having luxuriated in the mere sound of his full-sized big band (4 trumpets, 4 trombones, 5 horns, 5 piece rhythm section) but beyond the familiar gorgeousness of a big band (I played in many and there is nothing, but nothing in the world like it for sonic power and warmth) I was constantly surprised by the freshness of Rousseau’s writing. The band was obviously structured like a jazz big band, and filled with great young players of jazz, and the music was certainly informed by jazz (as well as electronica, hiphop, etc. ), but it never felt entombed in jazz. It never felt beholden to tradition. It was constantly busting out in unexpected directions and never offered up a single swing or bop cliche. Although it has been years since I’ve listened to Carla Bley’s or Toshiko Akyoki’s music from the ’70s, Rousseau’s reminded me of it, yet also felt very much of the moment, very today. For a long while I’ve felt the same way. 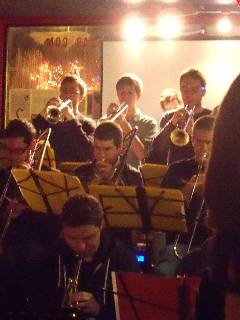 Hearing Franky Rousseau’s Large Band and this Montrealer’s promising Post-Modern-Canadian-by-way-of-New-Orleans-by-way-of-the-world music has given me – as I guess Franky wanted it to – hope. The drummer’s name is most probably Arthur Hnatek and the guitar player is also probably Michael Valeanu. Thanks for listening and writing about it. Franky was a student of mine, and though we never got as far as Toshiko Akiyoshi or Carla Bley’s music in the class I taught, I had mentioned them both as influences of mine, so I wonder if that rubbed off somehow. I would love to take full credit for his musicianship, but he so obviously is responsible for his own development that I can’t in good conscience hold him up for show as one of mine. I wait with bated breath for more out of this band and Franky. One slight correction: five SAXOPHONES, not horns. Horns are french horns, unless you are using “horn” as a slang word for any wind instrument, which would mean 13 horns in this band. You could say “five woodwinds” if they are playing instruments other than saxes.